The post today is from Wedding Photographer Lesley Pattinson of Memories Thru a Lens. She takes beautiful shots and has very kindly shared her secrets of photographing the perfect First Dance shot with us. You can see more of her work or book her for your special day at www.memoriesthrualens.com. 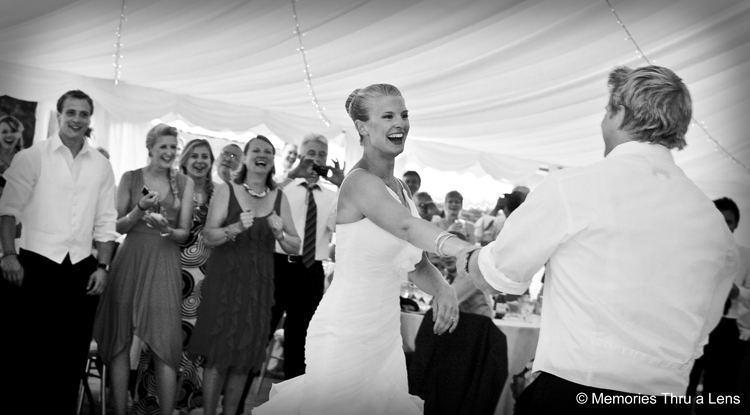 "This photograph was taken at a wedding reception in a marquee near Thame, Oxfordshire. The documentary wedding photo was taken with my Canon 5D and my 70-200mm lens. This image was taken at 200th sec @ f5 ISO 320. I have used flash in this image. The first dance is an important moment for lots of bride and grooms and it can provide some great photos that help tell the story of your wedding day. It was a sunny summer day when this image was taken, but being inside a marquee meant it wasn’t all that bright… for my camera anyway. So as I had been photographing inside the marquee during the reception and speeches I had already decided to up my ISO to 320, this helped lighten the shot to ensure the people in the background of the image could be seen. My next decision was to set my shutter speed to 200th sec, this is because with the bride and groom dancing I needed a fast shutter speed to freeze them, this ensured I did not get movement blur. I wanted a little depth of field in this shot, I wanted the focus to be on the brides face and although I wanted the guests behind her to be part of the shot they where the secondary subject, so I opted for f5. With both the shutter speed, aperture and ISO I had chosen the image was still a little dark. I did not want to increase the ISO so I decided to use flash. I didn’t want the flash to be too harsh so luckily being in a big white marquee I had a lot of places to bounce off. I dialed the flash down by one and then bounced it off the ceiling of the marquee this gave me just the right amount of soft light. I love the happiness in this image, it captures the true essence of a wedding reception. Everyone is merry and celebratory, including the bride and groom and that is what I wanted to capture in this particular documentary wedding photograph." Amazing 40% off wedding dance lessons offer!! !